Some of my favorite events during the winter months are these indoor farmers markets put on by Slow Food Central New Jersey. It’s a chance to catch up with some of your summer farmers market vendors, run into friends, entertain the kids, listen to music, and and generally celebrate all things local. The next one takes place Saturday, January 23, Hosted by Northeast Organic Farmers Association (NOFA-NJ) from 10 am – 2 pm at the D& R Greenway’s Johnson Education Center, One Preservation Place, Princeton. Particpating vendors (so far) include: Terhune Orchards, Cherry Grove Farm, Stony Brook Orchids, Valley Shepherd Creamery, Woods Edge Wools Farm, Simply Nic’s Shortbread, Catherine’s Vegan Sweets, Pure Indian Foods Organic Ghee, and Village Bakery. A suggested $2 donation benefits the programs of Slow Food Central New Jersey. The third, and last one of the season, takes place February 28 at Tre Piani in Forrestal Village, and you won’t want to miss that one either. By the way, if you aren’t already a member, why not join Slow Food Central NJ and help us organize more events in our area? We’ve got great ideas, we just need more willing hands. Don’t forget the new indoor market taking place in Stockton, next to Riverbank Arts gallery. 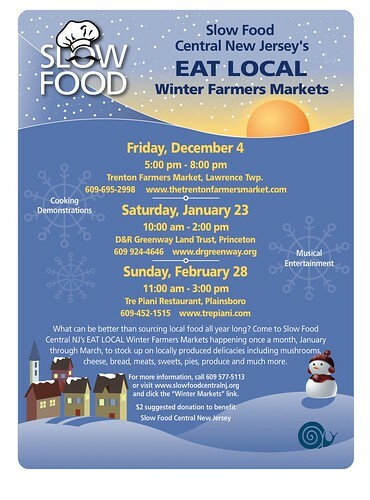 Read more about it at http://www.buckscountytaste.com/2010/01/welcome-stockton-market/.Great vendors! Thank you, I’m so excited Bobolink is moving down our way, and it’s great to know they’re at this market Sundays.